California Democratic Party Chair Eric Bauman’s third-in-command is calling for his ouster over claims he sexually harassed and assaulted people at political events, according to a letter making the rounds on social media. 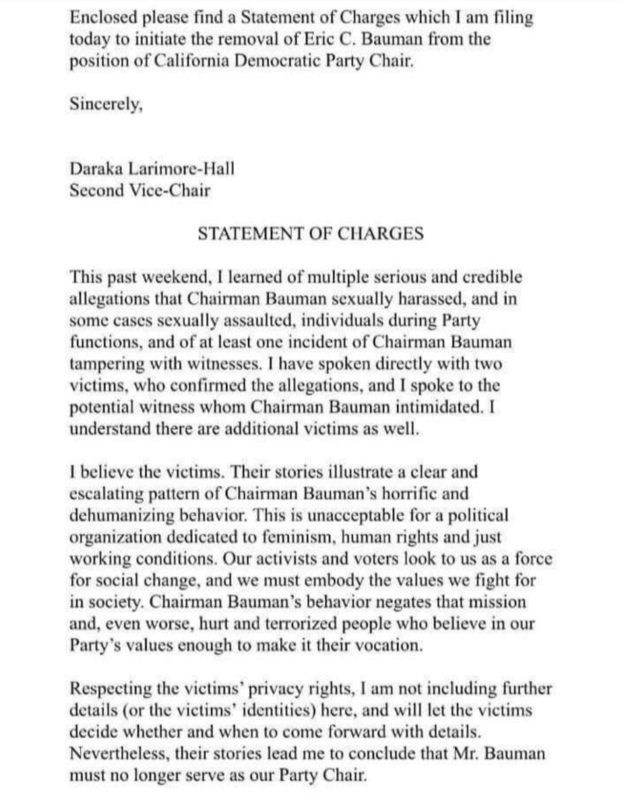 In the letter excerpt attributed to Cal Dem Vice Chair Daraka Larimore-Hall, he says he filed a complaint against Bauman—the first openly gay head of the state party—after hearing “multiple credible and serious allegations” that he assaulted men at party functions and, in one case, tried to intimidate witnesses. Larimore-Hall, the third-ranking party official behind Alexandra Gallardo-Rooker, apparently says in the letter that he spoke directly with two accusers and believes more are out there. “I believe the victims,” the letter reads. “Their stories illustrate a clear and escalating pattern of Chairman Bauman’s horrific and dehumanizing behavior. Bauman has yet to respond to a request for comment. As does Larimore-Hall. Congressman Ro Khanna (D-Fremont) tweeted about the allegations just before 8pm Friday, calling the claims “shocking” and advocating for Bauman’s replacement with Stanford University professor Michele Dauber, should she decide to run. Dauber spearheaded the nationally watched recall this year of Judge Aaron Persky, whose controversially brief sentence of sexual assailant Brock Turner became a flashpoint in the #MeToo movement. “We need a bold feminist to lead for 2020,” Khanna said. In a message to San Jose Inside, he followed up by saying he believes Dauber has the expertise to revise the Democratic Party rules to ensure a swifter response to these kinds of claims, and justice for victims. The allegations of sexual assault that @DarakaKenric is filing against @EricBauman are shocking. CalDems should replace him with @mldauber who is one of the nation’s foremost scholars on sexual harassment & led the Persky recall campaign. We need a bold feminist to lead for 2020. Dauber thanked Khanna for his endorsement. She also pointed out how the claims against Bauman are part of a bigger problem plaguing political leadership in this country, which the Enough is Enough Voter Project—a political action committee she launched in the wake of the Persky recall—aims to fix. Khanna’s tweet elicited criticism, too. Some people suggested that the allegations might be politically motivated. Others objected to the congressman broadcasting the allegations on Twitter before the party has a chance to finalize its investigation. Congressman, do you really think this is the proper venue to discuss very serious allegations against someone with no investigation whatsoever? And to suggest someone with very little experience in the California Democratic Party to lead that body? Still more observers jumped in on the Twitter thread to say that a more fitting successor for Bauman would be Kimberly Ellis, who lost the election for party chair by just 62 votes after a contentious race in 2017. Dauber and Khanna agreed that Ellis—who represented the more progressive wing of the Democratic Party—would be well qualified for the role, if she still wants it. Ellis did not immediately respond to a request for comment. Kimberly Ellis is a great choice, and I would also be very supportive if she decides she wants the position. The underlying point in all this, Dauber said, is that both parties should make sexual violence and sexual harassment voting issues, and a litmus test for leaders. Dauber said her heart goes out to Bauman’s alleged victims. A series of obscure elections recently took place with potentially profound implications for the fate of the California Democratic Party. Why Does PG&E Get to Decide When to Turn Off the Power? > Bauman has yet to respond to a request for comment. As does Larimore-Hall. Which illustrates another valuable contribution to society by San Jose Outside the Bubble. The Bubble will provide salient comments WITHOUT the need for a “request for comment”. > CalDems should replace him with @mldauber who is one of the nation’s foremost scholars on sexual harassment & led the Persky recall campaign. We need a bold feminist to lead for 2020. The power the State Chair has? What power? And these people were law professors? Two sources allege Khanna stole a Bentley, o am not sure if they will come forward. This was the slippery slope I was warning people in the Party about. Once political figures are convicted in the press without a right to a trial, everyone is subject to having their lives destroyed based on unproven allegations. Daraka’s parents are both criminal defense attorneys. Why is he doing this? So in this movie, does Dauber or Khanna play the dissenters or part of the mob? You decide. > Once political figures are convicted in the press without a right to a trial, everyone is subject to having their lives destroyed based on unproven allegations. You mean “unproven allegations” like those against Justice Kavanaugh? The progressive power brokers have studiously avoided connecting Christine Basely Ford and her festival of “unproven allegations” with enabler, soul sister, and fellow Stanford faculty member Michele Dauber. Convicting people in the press without the right to trial IS Michele Dauber’s modus operandi. Exhibit A: The recall campaign against Judge Aaron Persky. First of all, I think we go with “survivors” not victims as the more empowering terminology. Second, it’s disturbing to me that Dauber immediately went with “violence against women” is something we should prevent when, in this case, the alleged survivors are men. Nobody doubts that patriarchy is real, but claiming some sort of “monopoly’ on oppression is inaccurate and unhelpful. Third, the replacement should be Ellis not Dauber. She was close and has the relevant background to run this complex organization and came in a very close second in the chair election. Finally, there are some odd things about this (how some folks had advanced notice, etc) that should be examine. Even if it doesn’t speak to the veracity of the allegations, I think one should look at how these things are turned into stories. Khanna refuses to support Latinas for State Chair. Not a real journalistic venue.. Fake just like Daraka .. Totally homophobic power grab. Not even a good try.. You are a loser Daraka..And now it’s on. As we recall, an entire region of the country followed the rules set forth by Khanna. Now that you mention it. Khanna and Dauber decide to attack an openly gay man, and given that sources say that Khanna has issues with people like Bauman. We cannot identify these sources for fear of violating their privacy. Didn’t Daraka support Ellis for Chair over Bauman? And now he’s suggesting her as his replacement? What do the by-laws say? Does The first VC, a Latinx woman, get the spot once the investigation is completed? Or does The CDP Exec Board make that decision? So what!? It’s about time that supposed ADULTS learn how to handle these situations without resorting to government and hysterical screechers to take care of the situation for them. Mr. Omar Torres complained to the high heavens that Eric Bauman had assaulted him at a Democratic dinner in San Jose at a fairmont. Another one of his elected members of the central com complained during endorsements that he (Jordan Daniel Eldridge) has been assaulted by a local political consultant and posting in fb about it. Omar Torres, the guy that caused Carrasco, John Shallman client, 7000 in fines. Oh, does the Vice Chair take over if the Chair resigns? I am sure Bauman must be working for the Saudis. A “two-fer”: white shaming AND male shaming. Oh, and isn’t Michele Dauber a “white, privileged Stanford” law professor? I’m kind of a bumpkin just trying to connect the dots. You’re hinting that Dauber and Shallman colluded in pulling off a coup d’etat against Eric Bauman to take control of the California Democratic Party. Why not? Shallman runs Omar Torres, a Bauman accuser. Khanna, a Bauman accuser. Hall, A Bauman accuser. Why not? Ps, insiders point to two incidents when Shallman had clients attack gay activists using the same approach. Oh look, it’s the circular firing squad otherwise known as the Democratic Party in its full malevolent and immoral glory. The politics behind this online assassination attempt is well known to anyone following the recent races for leadership among Cal Dems. That they even more deeply embrace the profoundly troubling and proven self-Immolating techniques of killing one another off in ways that reveal the least democratic means possible? That’s just sad. These people are sad sacks and will eventually suffer from the same abuses that they are perpetrating here. What goes around comes around. If Dauber is such a leader, why has she failed to file her major donor campaign statements? This is not the forum for blind accusations against someone who was duly elected. if any leader can be replaced with his opponent because some unnamed person accuses him or her of something, then there is no democracy. As for the allegations, in the United States of American, it’s innocent until proven guilty and a lot of my fellow Democrats have forgotten that. I’ve known Eric for a very long time and he has never acted unethically in my presence or in the presence of my children. I have watched him treat the party youth with more respect than most party leaders. He signed proposed platform planks to abolish the death penalty and end three strikes some times back. I have watched as Bauman has shown more respect to Kucinich and Barbara Lee than most of our Party leaders. I am probably the most progressive person in the Party and definitely to the left of Bauman as well as his accusers. Political differences should not trump the right to a fair day in court before a person’s reputation is destroyed based on unknown allegations.. Kimberly Ellis did not back Bernie Sanders, BTW, but demanded the Berniecrats back her in the last election. This caused a lot of confusion as a lot of Berniecrats did not understand why they were being ordered to back a candidate who opposed Bernie’s election. It is probably the reason Kimberly lost. The election was nasty and decisive. It’s time that sleazy politics ended. I like Daraka very much. I do not like what he is doing here and he should know better than to accuse in the press, rather than in a court of law. This looks way too much like a dirty power grab at the expense of the due process and the right to confront one’s accusers. This is now how you overturn elections. Imagine a society run by Khanna and Dauber. Show trials and witch hunts. Btw, I think Ellis actually won the Election. S.O.P. for the CA Democratic Party. Over 140 women who work in the Sacramento state capitol came forward to accuse CA state legislators and senior staff of sexual misconduct. Over 90% of the women AND 90+% of those accused were Democrats. The media never reported this aspect of the story. > Larimore-Hall, the third-ranking party official behind Alexandra Gallardo-Rooker, apparently says in the letter that he spoke directly with two accusers and believes more are out there. “I believe the victims,” the letter reads. “Their stories illustrate a clear and escalating pattern of Chairman Bauman’s horrific and dehumanizing behavior. Might any of the “victims” be under age? > There might also be a law enforcement investigation given that the allegations include sexual assault. Have any law enforcement investigators been told to “stand down” or “look the other way” or “let us handle this internally”? I hear Omar Torres reacts with scornful mobile phone calls to his victims who criticize Torres’s failed history of runs for office. I guess it’s the only tool in his box these days. I’m shocked, Never once did TV’s fake new mention this creep was gay.